TRADIZIONE TOSCANA - Dal 1933 il ristorante La Falterona, nel popolare quartiere di San Lorenzo, vanta una ininterrotta attività di ristorazione. Il locale, orientato a proporre il sapore della cucina tipicamente fiorentina, si basa su una selezione rigorosa dei prodotti più freschi e di stagione. SPECIALITA’ - Tra i primi fatti a mano si possono assaggiare i sughi di anatra, di coniglio, di cinghiale, di maialino e finocchietto selvatico. 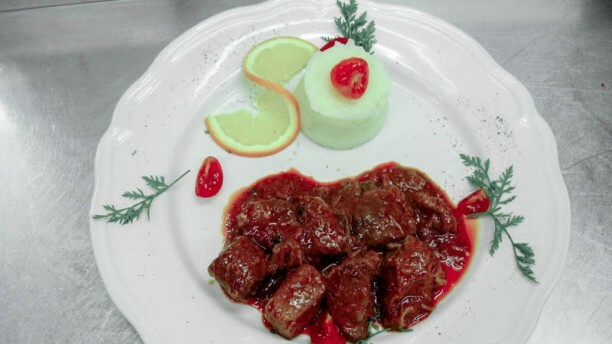 Tra i secondi il filetto di manzo argentino alle mandorle e riduzione di Porto, il petto d’anatra alla senape antica e miele e ovviamente la fiorentina e il pesce fresco. ANCHE ALL’APERTO - A disposizione dei clienti due sale interne climatizzate ed una ampia terrazza estiva dove è possibile da marzo ad ottobre mangiare all’aria aperta. The steak was bigger than I expected. The texture was very nice. However, it was very salty. VERY VERY SALTY. They put on too much salt... The waiter was very nice. Outstanding food, great service that was thoughtful, personalized and really wonderful for all concerned, and a superb meal. We will return! Food outstanding. Truffle soufflé was memorable. Waiter very knowledgeable about wines, shared that. A great meal! A wonderful restaurant with great food, service and atmosphere. They have standard fare along with mostly beautiful, unique dishes. Anatra (roast) duck, Cantucci encrusted miale (pork), pollo and croccante verdure are a few of the fantastic dishes. Also Bistecca Fiorentina is a big hit. Best ristorante in FIRENZE in my opinion. Food was great. We had the T- bone steak n it was huge n delicious. Juicy n done just right. Service was excellent. La Falterona is delightful restaurant with a wide variety of quality dishes. These are truly Italian dishes but not cliche’ Italian. Quality ingredients, magnificent preparation and respectful and attentive service. The quality is consistently high with prices that are very reasonable for the unique and exciting entrees. Extensive list of high quality wines with a nice range of price points to value. We travel Italy extensively and La Falterona is at the top of our list in Firenze certainly and in our top 5 favorites in all of Italia. Complementi a Claudio e Amalia! The personal is engaged but only to the point they expect additional orders. Thereafter you feel like melked. For the quality it was to expensive. Spaghetti frutti de mare in and to eat from alufolie is not aceptable at all. Frist and last time i was there. very kind, very nice service ???????????? Celebrated my dad’s birthday here and they surprised him with a birthday cake! We enjoyed the food, the ambience, and the service! We highly recommend this restaurant! Awesome experience. The host and owner were very accommodating. We felt very well taken care of. Highly recommend!!! I really liked this place. Good for a night out with friends. Good selection of regional wines. Food was excellent and service was professional. It is tucked away off a small street with less foot traffic, so not as touristy. Service was top notch.